ISLAMABAD: The Election Commission of Pakistan (ECP) has outlined and explained the methods of casting a vote for the upcoming general elections on July 25. Ballot papers for the National Assembly seats will be green while white ballot papers will be used for provincial assemblies. A total of 220 million ballot papers based on security features have been printed, according to the ECP. 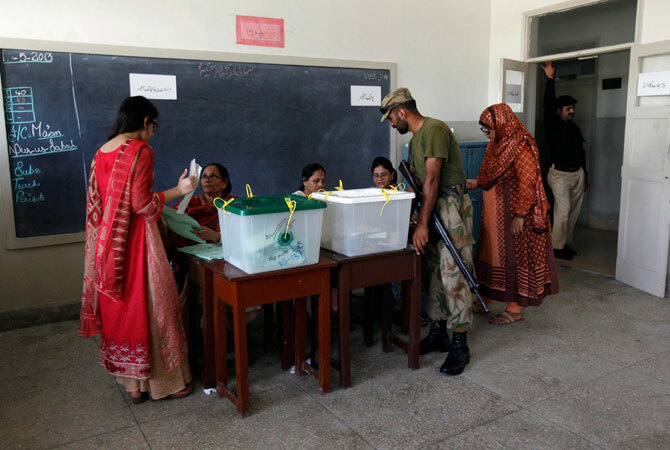 The polling officer will check the voter’s Computerised National Identification Card (CNIC) following which the voter’s name in the voting list will be checked. Then, the voter’s name and serial number will be called out by the polling agent following which the voter’s name will be crossed out on the list, voter’s thumb impression will be taken on counter files and the voter’s thumb will be marked with permanent ink. The assistant presiding officer will mark the back of the ballot paper with his signature after which the ballot paper will be issued to the voter. After the voter stamps on the election symbol of his or her choice, the National Assembly ballot paper will be inserted in the box with the green lid, while the provincial assembly ballot paper will be inserted into the box with the white lid. On July 25, polling will start at 8am and end at 6pm. Doors of the polling station will be closed after the voting time ends, however, any voters inside the polling station will still be allowed to cast their votes.